Performance of students in California has recently improved, but large numbers of students still remain poorly equipped to face a world of automation and economic change. Moreover, California’s economic future is in jeopardy, especially if the high cost of living impedes the flow of skilled in-migrants to the state. Cognitive skills of workers are closely related not only to their own labor market earnings but also to the economic health of the state. The strength of these relationships highlights the need for California to improve the quality of its schools. 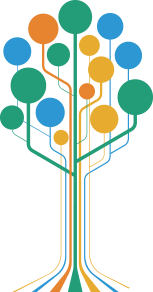 For the last half century, there has been extensive research into the value of human capital, or the productive skills of individuals. Much of this research has used a simple and convenient measure of individual human capital: school attainment, or years of schooling completed. More recent research has, however, shifted the focus away from years of schooling and toward cognitive skills as measured by standard achievement tests. Two reasons lie behind the superiority of achievement measures. First, school is not the only place where skills are produced; families and other influences outside of school are known to be extremely important. Second, years of schooling ignores key differences in school quality. Test scores implicitly incorporate these two elements of human capital and—while less frequently available in past research—prove to be good measures of skill differences among workers. Individuals with greater cognitive skills on average earn more throughout their careers. This economic advantage to skill is more important in the United States than in virtually all other countries. In other words, workers in the United States get larger gains from having greater cognitive skills. But that also implies that American workers who lack sufficient cognitive skills get punished more than in other countries. This latter effect is particularly salient for California, where there is a large unskilled population. High levels of cognitive skills also permit workers to adjust to changes in jobs and the workplace. Specifically, with the rapid increase in automation and the influx of robots, better educated people are able to move to the new jobs that are created along with automation. Research has also shown that a state’s long-run economic growth is highly dependent on the skills of its workforce. The research behind this finding is complicated because, while we have test scores for a state’s students, we do not have test scores for all of the workers. Workers have been educated at varying times, in different states, and even in different countries. Once these factors have been taken into account, a clear relationship between work force skills and economic growth can be seen. California has a reasonably good work force in terms of skills. This quality comes from the historic ability of California to attract highly skilled workers from other states and other countries. It may not continue to be the case, however, because of the high cost of living in California, including burdensome tax rates, and because of potential restrictions on immigration into the United States. It is possible to compare the performance of California students to those in other states. The National Assessment of Educational Progress (NAEP) regularly tests student performance in math and reading. The most recent round of NAEP testing, conducted in 2017, provides a portrait of where California students stand. Figure 1 graphs the average eighth-grade math performance of all of the states. California comes in forty-first. More stunning is the fact that the average eighth-grader in California would perform at the 30th percentile of eighth-graders in Massachusetts. This performance does represent an improvement over the past. 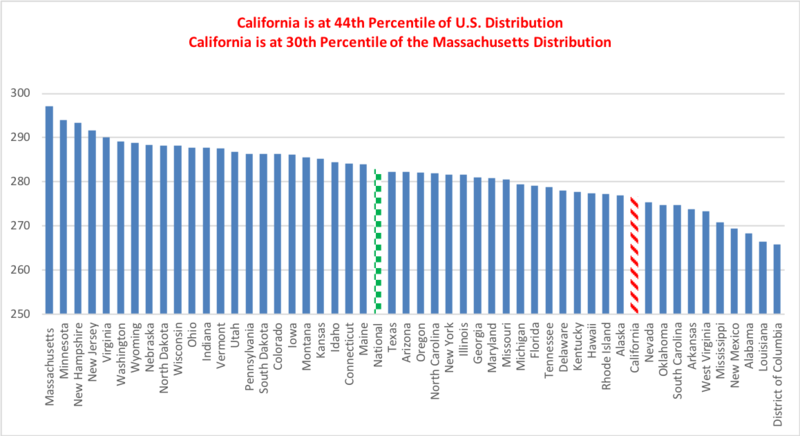 In 2013, for example, California students were just at the 25th percentile of eighth-graders in Massachusetts. This test performance is of course not solely determined by schools. For a long time it has been recognized that families, neighborhoods, and peers have a strong influence on student achievement. The observed test scores represent the outcome of the combined influences of all of these factors. The focus on schools in this discussion is not meant to imply that schools are completely responsible for the level of student achievement. Instead, this focus recognizes that policies for schools are the most likely way to get improvement. Importantly, we as a nation are generally reluctant to intervene in what happens in the family. Indeed, California has a school population that is more disadvantaged than that in many other states. Nonetheless, if we compare performance of just white, black, or Hispanic students across states, California students remain below average. One way to see the differences is to compare California performance to performance in Texas or Florida, two states with a similar distribution of students. As seen in figure 1, students in both states outperform students in California. As noted, economic growth of states is closely related to the skills of the workforce. California has in the past been able to attract skilled workers from other states and from other countries, so the workforce is not the same as the school population. Nonetheless, the majority of future workers will still come through California schools. Thus, the future economic well-being of the state is tied to the quality of the schools. Table 1 displays projections of the California economy based on the historic relationship between worker skills and economic growth. The projections assume that historic migration patterns continue. These projections also assume that the school improvement process takes ten years to complete and that these students replace retiring workers over time. As such, it takes some time before the workforce is noticeably different and before the economic growth becomes significant. The projections calculate the estimated differences in gross state product (GSP) between an economy with the current workforce skills and one with improved skills through school improvement. All estimates reflect the patterns of economic gains for the remainder of this century calculated in present value terms; i.e., current GSP is weighted more heavily than future GSP. As seen in table 1, bringing students up to the level of Massachusetts has an astounding impact on the California economy, representing a gain in current dollars of over $16 trillion. This amounts to a GSP that averages 15 percent higher than the no-improvement GSP for the remainder of the century. Of course, reaching the Massachusetts level of performance in ten years probably is not feasible. On the other hand, reaching the level of performance of the state of Washington, the best performing state in the region, is more feasible. This would mean an average increased GSP of almost 10 percent for the twenty-first century. Large gains would also follow policies that just brought up the bottom end of the distribution. Ensuring that all students were at the basic level in NAEP would boost average GSP by close to 7 percent. Finally, table 1 shows even larger improvement from reaching the performance level of Canada. This yields very large changes of the same order as getting to Massachusetts (which is close to the performance of the foreign countries in table 1). Existing research makes a very simple point: the most important element in school quality is the effectiveness of teachers. This research also makes the point that teacher effectiveness is not closely related to teacher degree levels, to teacher experience, to what kind of institution the teacher attended (e.g., education school or other), to teacher certification requirements or attainment, or to the amount of in-service training or professional development that the teacher has had. Because these common proxies for “teacher quality” are not related to effectiveness in the classroom, the California policies of emphasizing just these factors and of paying teachers according to these factors are not leading to a uniformly effective teaching force. Indeed, as highlighted by the Vergara court case, California policies at times lock in very ineffective teachers. The magnitudes of gains from improving the schools, as seen in table 1, seem large enough that it is worth pursuing policies that might be politically difficult. These policies would include developing better accountability measures for both schools and teachers. The current versions of accountability in California make it very difficult to compare schools serving similar populations and make it virtually impossible to compare teachers on the basis of their effectiveness. These accountability systems should include some element of absolute performance levels but should be heavily weighted toward value added. Coupled with good evaluations would be programs to reward success and to put an end to failure. Importantly, schools should not be rewarded for failure, e.g., continual provision of more resources to schools that demonstrate bad outcomes. When policy makers are determined to do things to improve teacher quality, they often gravitate toward a position of making it more difficult to become a teacher: increasing credential requirements, making entry to education schools dependent on quite high test scores, and the like. A more sensible approach is to open teaching up more broadly (rather than closing alternative paths) but then to make it more difficult to stay in teaching—i.e., evaluate performance during the probationary period and make decisions on what teachers do in the classroom. (This approach is related to the underlying ideas behind Vergara; teachers effectively get tenure after fifteen months and eliminating teachers on the basis of experience as opposed to effectiveness is a reduction in force). The appropriate policies would also include “smart choice,” for example, encouraging further expansion of charter schools but really holding them responsible for performance. Choice provides incentives for traditional public schools to improve, because they lose resources if students leave for charter schools. Existing research suggests, however, that parental demand forces are generally not strong enough to lead poorly performing charters to close on their own. Also, just as bad charter schools should not be allowed to continue, neither should bad traditional public schools. The answer from the existing research on teachers is to move toward a system much more focused on the classroom effectiveness of teachers. The essence is making the achievement of the children the center of policy attention, not the adults in the system. 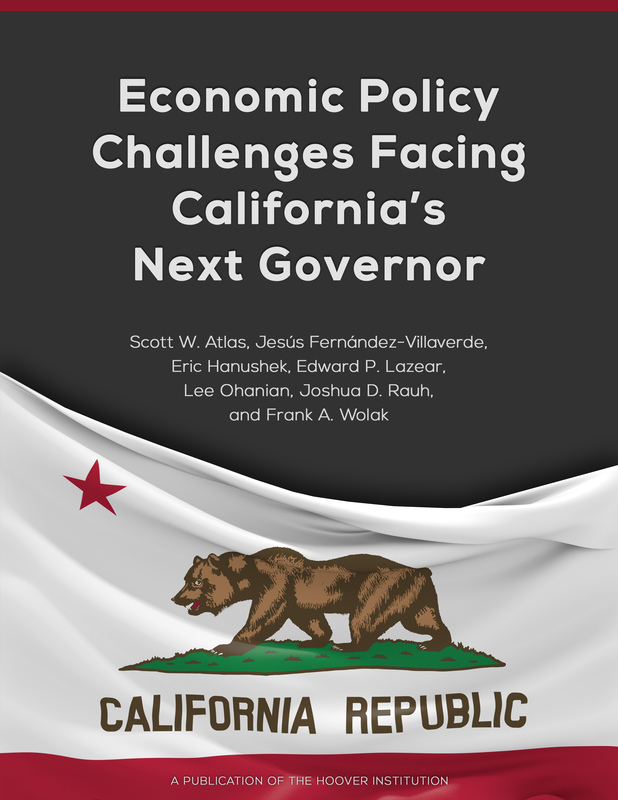 While politically difficult, the path chosen will have a lot to do with the strength of the California economy in the future. Hanushek, Eric A., and Steven G. Rivkin. 2012. "The Distribution of Teacher Quality and Implications for Policy." Annual Review of Economics 4: 131–57. Hanushek, Eric A., Jens Ruhose, and Ludger Woessmann. 2016. "It Pays to Improve School Quality: States that Boost Student Achievement Could Reap Large Economic Gains." Education Next 16, no. 3 (Summer): 16–24. Hanushek, Eric A., Jens Ruhose, and Ludger Woessmann. 2017. "Economic Gains from Educational Reform by US States." Journal of Human Capital 11, no. 4 (Winter): 447–86. Hanushek, Eric A., Jens Ruhose, and Ludger Woessmann. 2017. "Knowledge Capital and Aggregate Income Differences: Development Accounting for U.S. States." American Economic Journal: Macroeconomics 9, no. 4 (October): 184–224. Hanushek, Eric A., Guido Schwerdt, Simon Wiederhold, and Ludger Woessmann. 2015. "Returns to Skills around the World: Evidence from PIAAC." European Economic Review 73: 103–30. Hanushek, Eric A., Guido Schwerdt, Simon Wiederhold, and Ludger Woessmann. 2017. "Coping with Change: International Differences in the Returns to Skills." Economic Letters 153 (April): 15–19.